Our event venue will offer an elegant backdrop for a wide array of events. The Ballroom seats 200 guests and is spacious enough for a 300 guest, cocktail styled event. Rental of the ballroom includes access to two connecting patios-one covered patio which offers seating, as well as a standing patio area with a three-tiered fountain. If you require more venue space, we can offer our connecting dining room at an additional fee. We offer exquisite cuisine for intimate parties of 50 or an extravagant occasion for 400. Our chef and his culinary team have created catering suggestions, but we also offer our personal attention to create a unique and personalized menu. We are ready to work with you on planning and hosting your next special event at our spacious event venue! Do I have to be a member to host an event at The Country Club of Oxford? Venue space is offered to members & nonmembers alike, although membership has its privileges with reduced fees & pricing. However, nonmembers are required to be sponsored by a member. The Ballroom can accommodate 200-seated guests. Need more? We have additional spaces you can rent! Can I bring my own catering or food? 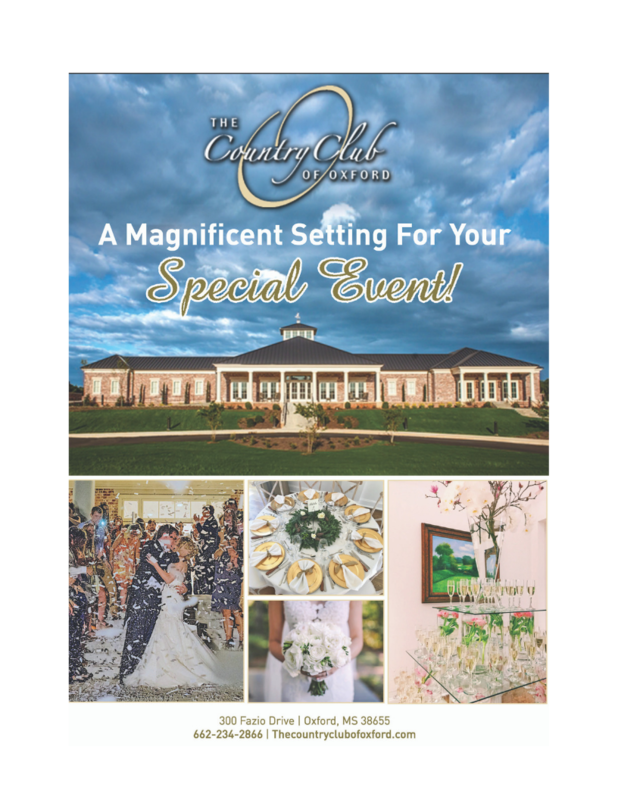 The Country Club of Oxford is an all-exclusive club & an on-site catering venue. We do not allow any outside food or drink, with the exception of wedding cake or birthday cake. A signed contract and a deposit of the full rental fee are required to secure your date. Who do I contact to book my event?